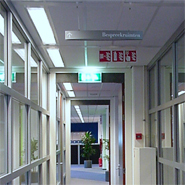 Specific requirements are imposed on the signage in offices, nursing homes and care homes, penal institutions, schools, kindergartens, shopping malls, etc. We develop and supply signage for the utility sector in line with the project-specific features and criteria. Information that needs to be put on escape and evacuation plans and signage has to be appropriate for very occasional use only. Because the area may only be visited as a one-off, people will be unfamiliar with the location and the risks it may present. We also take the architecture and corporate branding of a complex into account in the graphic design and use of materials. 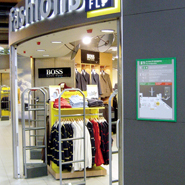 Safety signage can be integrated into an overall signposting system.